Starting off back in 1995, the Vans Warped Tour is the biggest showcase of bands and artists from diverse array of genres. This annual tour started off as a punk rock only event, but quite recently the lineup of the event has evolved a lot and now its features artists from various genres. So basically Warped Tour has something for everyone, and with your Vans Warped Tour tickets you can certainly expect an uplifting and stimulating experience! The Warped Tour is the creation of Kevin Lyman who came up with the idea back in 1994. Lyman’s idea was influenced by other shows like Holiday Havoc and Vision Skate Escape on which he previously worked. Both of these shows featured skateboarding contests along with the music. After the very first edition of the tour met with successful conclusion, with every passing year it started to attract more and more people. Due to its massive success, the tour became an international tour in 1998 when it hit various cities in Europe, Japan, Canada, Australia and United States. The following year, it went international once again as it kicked off in Australia and New Zealand before finally bringing the whole event to conclusion in Europe. It’s not just the music that the tour provides its attendees with. In fact it comes with loads of other attractions as well like bikers and skaters get to have half pipe. Since it features numerous booths and tents as well where all the bands can sell their merchandise, the whole venue also turns into a market place at times. These tents and booths also turn out to be a meeting place for the bands and their fans. The Vans Warped tour also started off its Warped Eco Initiative in 2006. With that initiative, the tour has made itself “environment friendly”. Ever since 2006, all the busses used by the tour, run on biodiesel and now the tour also features a solar stage which is run entirely by the solar power. They also make use of silverware and washable dishes for catering, and give out prizes to all those young ones who help in the recycling process. Compared to what the tour started off like, it has grown massively over the years. For example ever since the mid 2000s, the tour has been featuring no less than a hundred bands on each of its show. The tour has ten stages where the bands can play up to thirty minutes each. Out of these ten stages are the two main stages where the headlining and more mainstream bands play. At times, the tour has several bands playing at the same time and they started playing at 11 am. The times, lineups and schedules of each stage are also posted right in the middle of the venue. Although the show features ten stages on which several bands are playing at the same time; the stages are placed in the venue in such a manner that none of the bands is interrupted by the sound of the other band playing. Fans even have a choice of voting for their favorite act, if they want them to perform for longer amount of time. The tour also features a BBQ Band that prepares food for other bands and crew in exchange for a chance to play on the tour. Some of the famous bands like The Fabulous Rudies and the Dropkick Murhphys used to be amongst the BBQ Bands on the tour. Like always, this year’s lineup features some of the top notch bands from both the mainstream and underground music scene. Includiing names like Paramore, Pepper, A Day to Remember, The Devil Wears Prada, Jack’s Mannequin, Asking Alexandria, Of Mice & Men, Set Your Goals and many more; this is surely going to be an event to remember forever. So don’t miss out on this party of the year, and make sure you get your Vans Warped tour tickets before our stock runs out. The Warped Tour, also known as the ‘Vans Warped Tour’, is a traveling festival of extreme sports and musicians playing varied music. This festival usually attracts musicians playing metalcore, pop, hip-hop, reggae, alternative rock, ska, and punk rock. 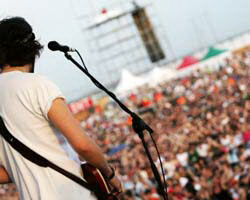 This touring festival takes place in large parking lots and other open fields where tents and stages could be erected. It has acquired the status of an academy for new and aspiring musicians, as it gives them access to fans and record producers. The festival is particularly of interest to kids, since their favorite bands are often playing at this festival and extreme sports like skateboarding attracts them. Kevin Lyman of ‘Holiday Havoc’ and ‘Vision Skate Escape’ came up with this novel idea in 1994. These shows were skateboarding shows which presented skateboarding competitions with music. The festival takes its name from now defunct music, skateboarding, snowboarding and surfing magazine called Warp Magazine. It was published by Transworld. Initially, the festival featured third wave ska and skate punk bands, but as it gained momentum, it became more diverse and started to invite pop and rock bands. It took this novel idea of Lyman’s only 4 years to go global. In 1998, the Warped Tour was held in countries like Canada, Europe, Japan and Australia. Only a year after, it was held in New Zealand. This festival is simply packed with fun-filled activities. In addition to great music of your liking, you would get to see half pipe for bikers and skaters. You could, if you want to, participate in these activities. While the festival makes you a participant from an attendee, it also gives you the golden opportunity to meet your favorite band or musician. The atmosphere is like of a community, where tents are occupied by bands, selling their CD’s, DVD’s and other merchandize. A particular band, after its stage performance, often comes back to its tent to meet and greet fans. This is also an excellent opportunity for you to get their autographs. In addition to the bands and musicians, tents are also occupied by non-profit organizations, magazine publishers, independent record labels and sponsors, to sell their merchandize or to raise awareness about a certain cause, etc. So how big of a show is it? Each year about 100 bands display their music for their fans during the Warped Tour. There are about 10 stages and each band gets about half-hour per stage. The band then moves on to the next stage. The more famous musicians however play on two main stages only. The festival is not an all-night thing. The bands start in the morning and the show is wrapped up by 9 in the evening. If there are 10 stages, than 10 bands are playing at a time, but the stages are at a distance, so the attendees aren’t listening to all the bands at the same time. It is only fair that the most famous band gets to play the longest. You can vote for your favorite band online and more the votes, better chance your band has of playing the longest and be the last band of the night. The Vans Warped Tour has also invented the unique idea of a “BBQ Band”. A BBQ Band gets to play at the festival in exchange for cooking food for other bands. Bands like Animo, The Fabulous Rudies and Dropkick Murphys, have been BBQ bands. Another great fact about this musical and sports festival is that it is environmentally friendly. In 2006, the management of this festival started Warped Eco Initiative (WEI). The buses that visit this festival are run on biodiesel, reducing petroleum by 30 percent. The stages are powered by solar energy. The caterers use washable silverware and dishes rather than disposable cups, plates and utensils. Environmentally friendly food packaging is preferred over ordinary packaging. And to raise awareness amongst the kids, the management induces them with free pizzas, when they volunteer to recycle. So all in all the Warped Tour is a great fun-filled and environmentally friendly festival, attracting Americans and foreigners from all over and from all walks of life. It ties the attendees into one tight knit community of music and sports lovers. So if you haven’t already then buy your Warped Tour Tickets now and be a part of a great American community! Q:Do i need to be a member for getting discount codes for vans warped tour concert tickets? A:You can get discount codes for vans warped tour Tickets by following simple instructions online. you don't need to be a member. Q:What is the delivery time for warped tour tickets? A:Vans warped tour Tickets take two weeks time to get delivered to customers. Q:Are there any hidden charges in vans warpad tour tickets prices? A:No, the Vans Warped Tour Tickets prices are exactly as they are mentioned and contain no hidden charges whatsoever. Q:Can i Get Discounted Vans Warped Tour Tickets from your website? A:Yes, you can get discounted Vans Warped Tour Tickets from us. Use the codes mentioned on our page to get them.